If you're like me you most likely ran out of space to secure your helmet on your Spyder and if you ride an F3 you really could use a place to be able to lock your helmet when you go into the store or a place to eat. A fellow Spyder owner has come up with a great way to secure your helmet and lock them in place on your handlebars. It's a simple design that's easy to install yet gives you peace of mind when you have to leave your helmet on the bike. You simply remove the stock 6mm screw and replace with a longer screw that holds the lock in place. If you already have IPS BAR END CAPS please note that in your order notes and we will include the longer bolts. Fits ALL RT Models 2010 - Present. Fits ALL F3 Models 2015 - Present. Fits ALL ST Models 2013 - Present. Fits ALL Spyders 2012 and newer. Does NOT fit 2008-2012 RS. Gravity is still in effect so make sure you have a good grip on your helmet when you unlock the lock. They work great and look good on the bike! Very easy install, look great. Very functional. Great company to deal with. Good value and easy to deal with!!!! I had looked at these for several months after buying my Spyder in August 2016, but put the purchase off. After taking several semi-long trips, where I had to use the storage space for other things I had to buy these! On back-to-back trips I caught someone trying to walk off with my helmet!!!! This product works exactly as described, was easy to install, and even easier to use when you're on the road. This needs to come with every Spyder! A needed and perfect accessory for any Spyder owner. I don't know why this doesn't come with every Spyder sold, as it should! Even my Honda Shadow had a helmet lock standard on it. 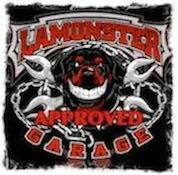 Five stars for a great product, awesome service (as always) from Lamonster Garage, and a VERY easy install. The locks were very easy to install. Now we don't have to carry our helmets with us when we stop. They were a snap to install and work great. I found that simply placing one of the strap rings in the lock works just fine. You don't have to use the included hangers if your strap ring fits in the lock as mine does. I have a Shark helmet. That's less things to have to store, lose or fiddle with. This is a great addition and it's used all the time.